The rules of this award: Thank and link back to who gave you this award, share 8 things about yourself, pass it along to 8 blogs that you recently discovered and enjoy, and leave those bloggers a message telling them about their reward. 1. I was born and grew up in a tiny northern village in Russia. 2. I love painting (mostly with watercolor). 3. I am a very aesthetic person, and always surround myself with beautiful things. 5. While in college, I was taking French, German and Spanish but I'm fluent only in English and Russian. 6. I have a ton of dresses. When I see a beautiful dress, I have to have it, even if I'll wear it only once. thanks so much for this sweet award and congrats on receiving it!! you look fabulous, love the jumpsuit and your face looks gorgeous! Very chic! I wasn't so sure about the jumpsuit thing, but I think you have me convinced. And as for your hair... I can't wait till mine reaches that legnth! It is beautiful! Congrats on the Sylish Blogger Award! You deserve it! I am a new follower now. I hope you will take a look at my blog, and follow if you like. You look absolutely stunning!!! The jumpsuit looks great on you and the blazer iz a perfect top off!!! Very classy! Thank you so much for giving me the award! I have been smiling all day! I feel so honored! You look sooo lovely in your jump suit! Great blog, I just followed you! Thank you very much, everyone! Kisses! I have a friend who was born in Russia too. I love your outfit! You look beautiful! You look goregeous in the jumpsuit! Congrats for the award, really think you deserve it! Following you now!! Please follow back :)would be a honour! love the jumpsiuit, you look great on it! The oufit is very cute! Love your blog, you definitely got some style! So I am following! You just look incredible in the jumpsuit! Love the combination and your hair looks amazing! 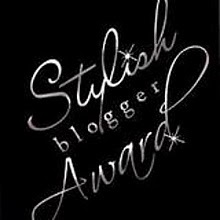 Thanks so much for the stylish blogger award on your blog, you're adorable!